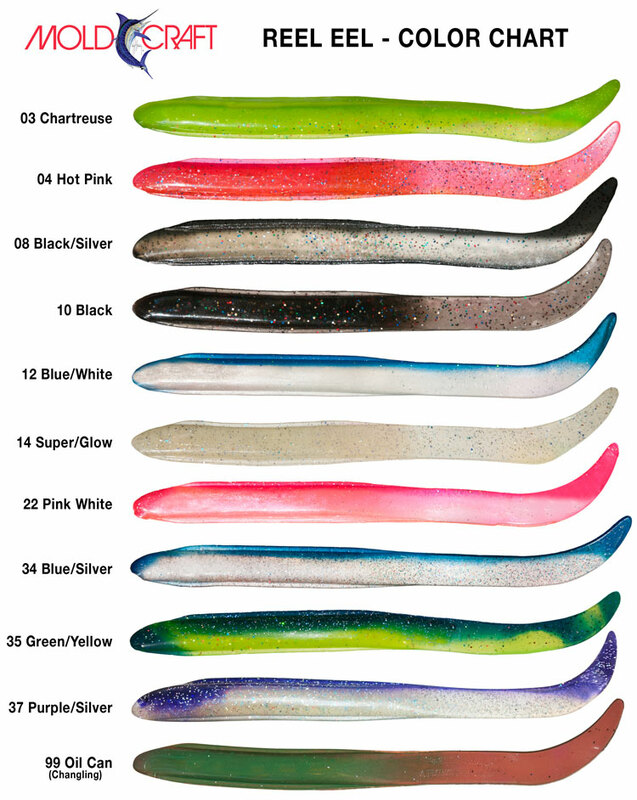 REEL EEL Available in both 7" and 10" CASTA HOO 8" sizes and in the exciting colors shown. 3 pack 1 rigged with 2 replacements. 6 pack unrigged or by the each in bulk. REEL EELS 7" rigged with 3/8 oz. High Gloss Black Extra Durable Powder Coated Jig head featuring Mustad 32786BLN 5/0 Hooks and 10" rigged with Mustad 32786BLN 7/0 in the 3/4 oz and CASTA HOO Mustad 91715D 9/0 in the 1 1/2 oz. Great for casting, trolling and gigging for Cobia, Snook and Stripers and Jigging for Snapper, Grouper, Codfish, and Halibut and many other species of game fish.